A year ago, President Trump's remarks about a violent white nationalist rally in Charlottesville sparked outrage. PRESIDENT DONALD TRUMP: You had a group on one side that was bad, and you had a group on the other side that was also very violent. SIMON: The backlash was intense. NPR's Ayesha Rascoe reports now on what has not changed for President Trump in the year after the violence in Virginia. 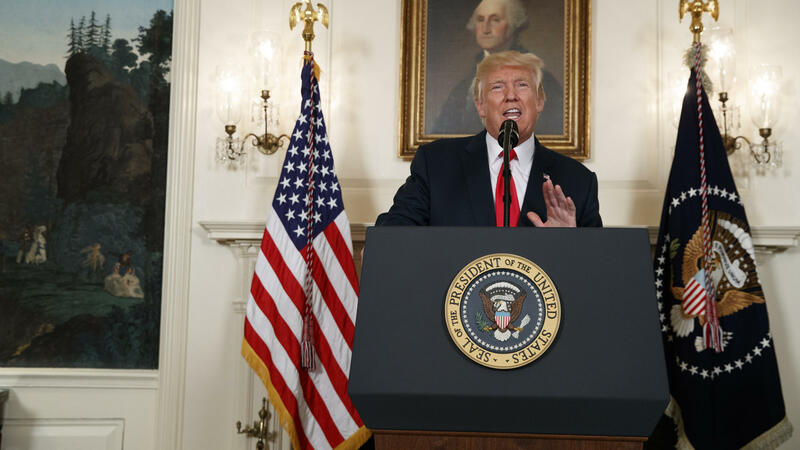 AYESHA RASCOE, BYLINE: On the day of the rally, President Trump seemed to equate the actions of counterprotesters with those of the marching white nationalists. RASCOE: Criticism of the president's words came from all sides. Members of his own party immediately condemned his reaction to the rally. It was the first time as president that Trump faced a rebellion in his own ranks. At first, Trump tried to clarify his comment by calling racism evil and white supremacy repugnant. But in a subsequent statement at Trump Tower, he seemed to double down on his original comment. RASCOE: Those words, fine people on both sides, went too far for Republican House Speaker Paul Ryan, who up to that point had been hesitant to criticize President Trump. PAUL RYAN: I do believe that he messed up. It sounded like a moral equivocation or, at the very least, moral ambiguity when we need extreme moral clarity. RASCOE: After the Trump Tower statement, there was speculation that members of Trump's Cabinet might resign. His top economic adviser at the time, Gary Cohn, acknowledged to the Financial Times that he faced enormous pressure to quit. But there were resignations from two White House business advisory groups; the groups later disbanded. The Trump Cabinet, though, remained intact. And soon, it was back to business as usual. Lawrence Jacobs is a political studies professor at the University of Minnesota. He says Republican leaders did not back up their complaints, and that sent a message. LAWRENCE JACOBS: The message to Donald Trump is, we're going to slap you on the wrist, but we're not going to take further action. In effect, it's been a spiral of silence in which Republicans see that, no, their leaders are not going to take real action. RASCOE: The White House defends Trump's response to Charlottesville. His staff says he's been clear that he condemns violence and white supremacy. Since Charlottesville, Trump has not stopped making provocative statements on race, whether on immigration or about black athletes taking a knee in the NFL. TRUMP: You have to stand proudly for the national anthem, or you shouldn't be playing. You shouldn't be there. Maybe you shouldn't be in the country. RASCOE: Comments like that one on "Fox & Friends" may not do immediate damage to Trump. His supporters at rallies seem to relish Trump's most strident speeches. But Jacobs says they may ultimately turn off some voters. JACOBS: While the president may have scored political points among parts of his base, he's also let loose significant opposition that past Republican presidents have not faced with this level of intensity. RASCOE: A recent Politico poll found that 55 percent of voters say race relations have worsened under Trump. We have yet to see whether concerns about his comments on race will outweigh the strong support of his base. The true test will be at the ballot box this November. Ayesha Rascoe, NPR News, Washington. Transcript provided by NPR, Copyright NPR.